Cyndi Brannen has many hats: witch, teacher, psychic, healer, and herbalist, to name just a few. 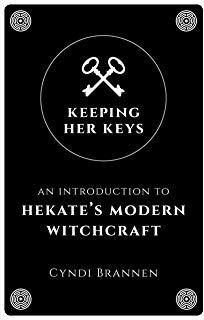 Devotee of Hekate and author of the popular Patheos blog, Keeping her Keys, Cyndi has now written a book all about Hekatean witchcraft: Keeping Her Keys: An Introduction To Hekate’s Modern Witchcraft. Cyndi was kind enough to take some time out to speak to us here at PaganPagesOrg. Here’s what she had to say. Mabh Savage (MS): When did you start writing your blog, Keeping her Keys, and what prompted you to start? Cyndi Brannen (CB): Keeping Her Keys launched on Patheos Pagan around Samhain in 2018. I started KHK because I felt compelled by Hekate to share my understanding of her and witchcraft with others. Honestly, I had to make a choice to close the door on my career in psychology because there was no way to go public as a witch and maintain it. This wasn’t an easy decision. It took years to get to the place where I was finally able to do it. Hekate waited. I persisted. Here we are today. MS: What inspired you to write a course on Hekatean Witchcraft? CB: From my perspective at the crossroads of personal development, spirituality and witchcraft, there really were no courses that focused on Hekatean Witchcraft. I created the course I wished I could take. Also, Hekate said to do it. MS: How did you design the course? Did you have students who tried out the material before you wrote the book? CB: Hekate’s Modern Witchcraft consists of three levels guiding students through the process of becoming a full priestess. In The First Key, students focus on their own development, the second is for mentoring peers and the third for priestessing of others. Each of the three levels is different based on these goals. In The First Key, each lesson consists of pharmakeia (plant spirits), goetia (working with spirits), and kleis (personal development concepts) all with Hekatean flair. Students create their own project and complete initiation. The central focus is on the development of the Inner Temple. Yes, everything I write or teach is trialed on others and myself. My process for developing content usually works something like this: receiving inspiration or a vision and then doing my best to honor this by creating quality content. Once the ritual, spell, monograph, etc. is ready to share, it’s tested by myself and others. MS: Your description of being called by Hekate resonates with my own experience, and I imagine that of many others. 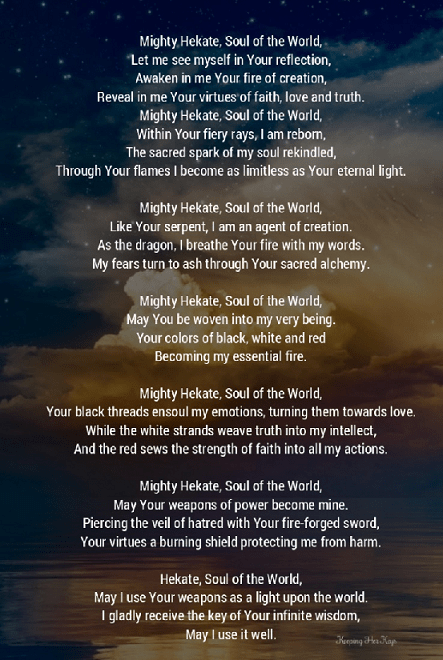 Why do you think Hekate often appears to potential devotees at their darkest hour? CB: This is such a great question that I’ve been asked many times. I don’t believe that any human can fully comprehend a deity, let alone know why they do anything. However, my theory is that Hekate resides in the darkest places, as a goddess and a force. I also believe that when we are broken, we become more open to all forms of truth, if we so choose. These two factors combined are what I feel is at work when Hekate calls us during our weakest moments. True initiation is found in these times. MS: I love your attitude that practitioners should do their own thing, or as you say in the book, ‘you do you.’ But, do you think there are certain key points that all devotees of Hekate should note, or certain actions they should all be doing? CB: The only rule that matters in witchcraft is “know thyself.” The only requirement I’ve encountered for Hekatean Witches is sincerity. This comes from a deep commitment to living our truths. In my experience, Hekatean Witchcraft is not for the casual practitioner. The three core values I teach are kindness, integrity and passion. Kindness refers to the fierce love of living your truth and allowing others to do the same. Integrity is about being that truth, and passion is the will to live it. Many Hekatean Witches regularly perform rituals and acts of veneration, especially on the Dark Moon. While it’s important to perform these rites, they naturally flow out of the core values. MS: Is there a particular epithet of Hekate that you are drawn to more than others? CB: Keeper of the Keys (Kleidoukhos) is the obvious choice, but there are so many other aspects of Hekate that are especially important to me. I see her as our Guardian, Guide and the Gatekeeper. All these have ancient names as well. She is Lampadios – Torch Bearer – of our Underworld journey, she is Enodia – literally of the road – who guides our material experience, and she is Hegemonen – Gatekeeper – of the mysteries. Perhaps beyond these specific traits, I understand her best as Anima Mundi – Soul of the World – the very fire that fuels all of creation. As Anima Mundi, her role as Witch Mother is a natural extension since witches work with the natural energies. MS: At one point in the book, you note that Hekatean witches can be ‘misfits, rebels and weirdos.’ Do you think Hekate specifically calls to those outside ‘mainstream’ groups or those who love what is considered an alternative lifestyle, and why? CB: Hekate is of the shadows, the liminal, the in-between. Her home is the darkness and she was borne of the stars. This is not the description of a goddess who calls to those who walk a more mainstream path. We burn bright as her torches. We live on the fringe and the frontier. Rebels, misfits and weirdos to some, but we are the ones who change the world. I love the diversity of Hekatean Witches, I have students in my course from all over the planet, from diverse paths and representing various groups often considered marginalized. Like Hekate’s ancient horde of the unwanted and outcast spirits, we are her chosen. Her companions, especially her ancient witches, are very much of the Underworld and shadows as well. Circe, Medea and the lesser known ones. We are their kin. MS: What’s the significance of the course taking a calendar year plus a day? CB: I can’t take much credit for the length of the course since it was downloaded to me from Hekate and her ancient witches. Thirteen moon cycles with initiation was their message, so I followed their advice. Of course, this structure is popular in many modern witchcraft courses. MS: How do you keep coming up with new ideas for the blog? CB: I honestly only write articles about subjects that interest me. My blog is about speaking my truth which happens to often be quite different than popular voices. At times, I feel inspired by the spirits and even Hekate herself. Others result from conversations and questions I get asked. When my creativity is low, I unplug from the external world until I find it again. For me, the feedback I’ve received from those who found comfort or a shared perspective in my words is the greatest source of inspiration. MS: Are there any other books on the horizon? What other projects are you working on? CB: True Magic: Unleashing Your Inner Witch will be available on Samhain this year. In late 2020, the second Keeping Her Keys book, Deeper into Hekate’s Witchcraft, will be released. The True Magic of Fierce Love is in the early stages. This is a book about standing in our power. The next class of The Sacred Seven and Hekate’s Modern Witchcraft: The First Key both start October 1, 2019. There’s also a secret project in the works that I can’t discuss just yet. MS: Do you have a favourite season or festival, and why? CB: Autumn is my favorite season, especially November. There’s something so Hekatean about this time of the year. It’s no surprise that there are two modern celebrations during this month. Night of Hekate of the Underworld is November 16 and Night of Hekate of the Underworld is November 30. Within Keeping Her Keys, these two days lead up to the Longest Night on the Winter Solstice. Combined they are referred to as the Holy Darkness. MS: How do you relax and wind down? CB: Living here on the coast, I am fortunate to be able to wander the woods or along the shore. Nothing restores my soul better than the ocean that surrounds me. Witch-crafting, especially my new interest in sculpting, is another way that I unplug from the writing life. MS: And finally, what are you most excited about for the coming year? CB: Having Keeping Her Keys and True Magic both published within six months of each other is very exciting. There’s so much going on in addition to these books coming out. Teaching the courses is so meaningful to me. I’m also very much looking forward to finishing the writing projects I’m working on. There’s much to be excited about and grateful for. Connect with Cyndi on Facebook or at keepingherkeys.com to learn more about her teaching and writing. Pre-order her books, Keeping Her Keys and True Magic, at Amazon now.